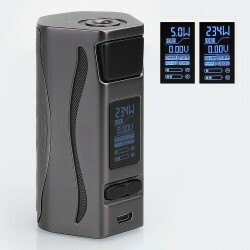 Huge discount for IJOY Genie PD270. 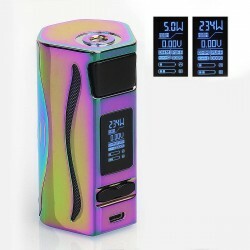 The Genie PD270 is a new box mod which follows up the hottest set from IJOY, the captain PD270 mod, packing in a unique mod design, and it has a 234W TC chipset from IWEPAL, powered by dual 20700 batteries, the Genie PD270 features a curved and ergonomic design intended to fit comfortably within the user’s hand during use and RGB backlight on device make for a unique user customization. There are 5 color options for the lights (red, blue, green, white and colorful) and 2 customize RGB color settings which can be programmed for different styles with digital color separation techniques. Genies PD270 is suitable for various atomizers in the market even no overhang with 30mm tanks. Whats more there is a LED flashlight control button on the battery door which supports the device used as a flashlight. 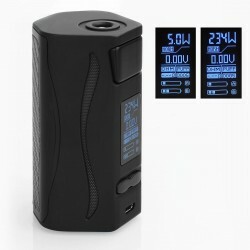 IJOY Genie PD270 is a critically acclaimed platform for users looking for a cool, magic and exquisite device. 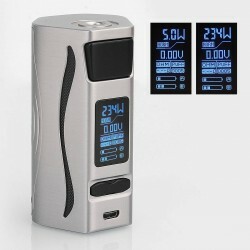 Please note: there is no battery included for this mod.